This is an attractive introduction to a complex, ingenious therapist and, to many, a guru. A handful of his colleagues and students sometimes seem to compete for his mantle. Erickson's papers are collected in four volumes. 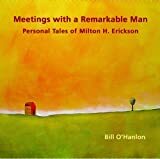 There is an excellent biography, Milton H. Erickson, M.D. : An American Healer (2006) edited by Betty Erickson and Bradford Keeney. For a broader introduction, The Hypnotic Brain by Peter Brown, M.D. (1991) has a fine example of Erickson's approach, while addressing the hypnotic phenomenon generally in its many guises.